This week in the war, on 20 July 1944, a German officer named Claus von Stauffenberg carried a bomb from Berlin to the Wolf’s Lair (Wolfsschanze) headquarters in Rastenburg, East Prussia, with a view to putting paid to Hitler once and for all. Von Stauffenberg had been wounded in Tunisia, losing an eye, his right hand, and two fingers of his left hand. (Colonel Radl, a character in Jack Higgins’s novel The Eagle Has Landed, is loosely based on von Stauffenberg.) During his convalescence, von Stauffenberg became convinced that Germany needed to be rid of Hitler and the Nazis. Despite the strong likelihood of failure for any attempt on Hitler’s life, von Stauffenberg believed that the attempt should be made—if only to show the world that decent Germans had tried to resist. On 20 July, after arriving in Rastenburg, von Stauffenberg activated the bomb’s delayed-action detonator and carried his briefcase, with the bomb inside, into the meeting hut where Hitler was scheduled to meet his generals. Von Stauffenberg excused himself, leaving his briefcase behind, and the bomb exploded soon after. Four of those present would die of their wounds but, apart from a perforated eardrum, Hitler was unscathed. In the confusion, von Stauffenberg was able to returned to Berlin but was shot by a firing squad soon afterwards—as were many that were accused of being implicated in the plot. Erwin Rommel was another casualty of the July plot. He was offered a choice between suicide on the one hand and a public trial and retribution against his family and staff on the other. Rommel chose to shoot himself. 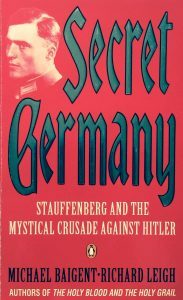 For a highly readable account of the German resistance movement, earlier attempts on Hitler’s life, and von Stauffenberg and the 20 July Bomb Plot, read Secret Germany: Stauffenberg and the Mystical Crusade against Hitler by Michael Baigent and Richard Leigh (Penguin, 1995). This entry was posted in Book and tagged July Bomb Plot, Michael Baigent, Richard Leigh, Rommel, Secret Germany, von Stauffenberg. Bookmark the permalink.